New Student Orientation (NSO) is for incoming Adult Undergraduate (AU) and graduate students, designed to help students transition into Augsburg University. Last weekend the Augsburg campus was host to students, staff, and faculty from area colleges and universities attending the Minnesota OUT! Campus Conference (MOCC). The conference, "A deeper look at race, economics, and immigration in GLBTQ communities," is a project of the Minnesota Campus Alliance, a statewide coalition of students, staff, faculty, alumni, and community members uniting for change on college and university campuses. Michael Grewe, coordinator of LGBTQIA services at Augsburg, said he was very pleased with the turnout. "Despite the snow, 375 LGBTQIA and allied students from around the state gathered together and learned knowledge and skills around LGBTQIA communities and social justice leadership," Grewe said. "MOCC was a moving and fun experience, and I'm incredibly proud of Queer and Straight in Unity for the tremendous leadership and vision they had to put this event on." The program included guest speakers and performers and workshops addressing issues prevalent in the GLBTQ campus community. The conference kicked off Friday night with a screening and discussion of the film "Two Spirits," a poignant true story of the oppression and unjust slaughter of a gay Native American man. Saturday's events included workshops, free HIV testing, and evening speeches by Susan Raffo, Lisa Weiner-Mahfuz, and national race and gay rights activist Coya Artichoker. Sunday's program continued with workshops and a wrap-up with guest speaker Kenyon Farrow, executive director for Queers for Economic Justice. Farrow has served as national public education director and continues to research, write for, and advocate for new approaches to the HIV epidemic in Black gay men in the US. Fia Goldfine, [pictured third from left] co-president of Augsburg's Queer and Straight in Unity chapter, says the conference was the opportunity of a lifetime for her. "It was exhilarating to witness the large amount of people who came together. The conference enlightened and educated, but the social aspect was an unexpected bonus. I came away with a whole new confidence in myself as a leader and a renewed sense of pride and belonging." The 2010 conference was twice the size of last year's, and this was the first MOCC held at a religious institution. 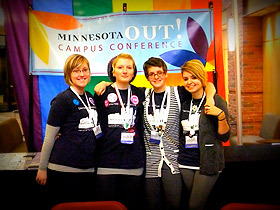 Augsburg's Queer and Straight in Unity and LGBTQIA Services hosted the event.